← I Met Santa Claus Today! Sometimes it takes another persons perspective in order for you to see a solution to a problem. Recently, while reading Big Magic by Elizabeth Gilbert, a age old problem reared it’s ugly head. That problems name is fear. I don’t have enough financial support. These are but a few. We creative types are also creative with our excuses. It was a long list. Big Magic inspired me but it also made me afraid. I knew this stuff. I’ve even written about several of the sub-topics from the book myself. But fear has entrenched its cancer into the very cells of my body so firmly that it was a combination of Ms. Gilberts refreshing views from the book as well as her Ted Talk, “Success, Failure and the Drive to Keep Creating”, that gave me hope that I could rid myself of this affliction. My aha moment came in the form of an analogy. 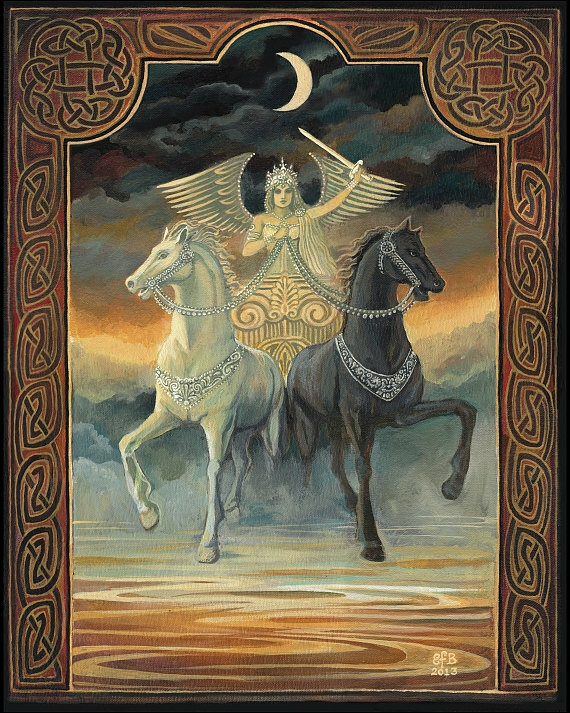 In a tarot deck there is a card called the Chariot. My take on it’s meaning is to harness the opposing forces within yourself in order to confidently move forward in life, the yin and yang, the dark and light…..success and failure. Elizabeth Gilbert suggests that both success and failure in life is inevitable. That is life after all. We learn, we fail, we learn some more and eventually we succeed. Success and failure are opposing forces, both wanting to pull you in completely opposite directions. Neither direction is wise to follow for too long of a time. The only way to move forward after experiencing success or failure is to rein in those rebellious horses and bring them back onto the path you set out for yourself. That being your commitment to your creative life goals, and, those goals are what must always be the driving force. They are your home key, your souls expression, your chariot. But you say, I’m not a creative soul. I don’t do art. I’m not crafty. Well we are all creative souls. It is a particular trait of human beings. If you can think and plan out a dream or a project or even a new route to work, you are using your creativity. Being creative is really just looking at something from your own unique prospective. Acting on it is living a creative life. This concept for me is huge. I know what it is like to have both success and failure take the reins. Neither end well if it persists in it’s extreme for too long. To bring your creative focus back around, it takes control, it takes discipline, but most of all it takes a commitment to yourself. A vow to nurture your creative gifts no matter what. That vow is your chariot and you are in the driver seat holding the reins. So next time your creativity flows and ideas are sparking, don’t let fear take control. Put blinders on that horse and snap the reins. It will get back in line and work in tandem with success to move you forward on the road of creativity and adventure. Your job is to commit to the path and drive that chariot. I’m glad the post resonated for you. I would highly recommend reading Big Magic by Elizabeth Gilbert. It’s a great read to get your creative life back on track. I am waiting my turn at the library 😊. I hope it does the same thing for me. I am not surprised that you drew the Chariot after your writer’s block post of last week. I hope that is over for you now and your creativity is flowing once again.